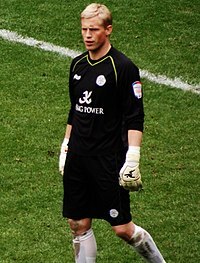 Kasper Schmeichel (born 5 November 1986) is a Danish professional association football player. ↑ 1.00 1.01 1.02 1.03 1.04 1.05 1.06 1.07 1.08 1.09 1.10 1.11 1.12 Soccerway.com, "K. Schmeichel"; retrieved 2012-7-16. This page was last changed on 4 November 2018, at 10:54.